The International Space Station has modules a many – with discussions under way to attach a privately built Bigelow Expandable Activity Module, or BEAM for short. 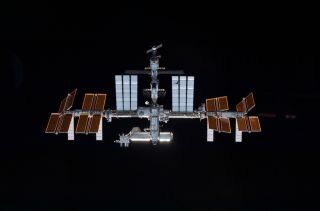 The International Space Station could get a new inflatable module supplied by the private American company Bigelow Aerospace, sources say. NASA is apparently in discussions with Bigelow to acquire a Bigelow Expandable Activity Module, called BEAM for short, to enhance use of the International Space Station (ISS). Since 1999, the North Las Vegas, Nev., company has been working to create affordable inflatable space habitats for national space agencies and corporate clients. Bigelow Aerospace's founder and president is Robert Bigelow, a Las Vegas-based general contractor, real estate tycoon, hotel businessman and developer. In 2006 and 2007, the firm launched orbiting prototypes Genesis I and Genesis II. Using the firm's patented expandable habitats, NASA hoped to greatly exceed the usable space of the International Space Station at a fraction of the usual cost. Lately, the company has focused on ever-larger expandable modules, notably the Sundancer and BA330 modules. Bigelow Aerospace sits on a 50-acre plot of land, with an expansion of the company factory now under way that doubles the amount of floor space as the business begins the transition from research and development to module production. The BEAM module that could attach to the International Space Station is sized tobe a larger version of the already-flown Genesis module. No agreement has been signed yet, said Michael Gold, director of Washington, D.C., operations and business growth for Bigelow Aerospace LLC, based in Chevy Chase, Md. "But we're looking forward to doing so in the near future and we're pleased about the progress." Gold said Bigelow Aerospace is working with the ISS National Laboratory program, as well as the space agency's Space Operations Mission Directorate, the Exploration Systems Mission Directorate and the Office of Chief Technologist. Officials in these offices "have supported and encouraged this initiative," Gold said. In 2005, Congress designated the station a U.S. National Laboratory with the goal of expanding the U.S. economy in space-based research, applications and operations. NASA considers the ISS a unique and highly visible national asset with surplus capacity available for a wide spectrum of applications. Moreover, the space agency is anxious to work with other agencies and organizations to pursue applications. "Most of all," Gold told SPACE.com, "we're excited to see the substantial technological progress made by Bigelow Aerospace via the successful Genesis I and Genesis II missions utilized to take expandable habitat technology to the next level by incorporating such a module into a crewed environment." Gold told SPACE.com that space entrepreneur and company head, Robert Bigelow, has invested $215 million of his own money to date "to bring the promise of expandable habitats to fruition." "We're thrilled to work with NASA to ensure that Bigelow Aerospace's unprecedented private sector investment and progress are fully leveraged to create the dynamic future in space that we are all working toward," Gold added. Still, a NASA agreement on use of BEAM is not a signed deal, Gold emphasized. "Good progress is being made, and we're looking forward to executing an agreement." The Bigelow demonstration proposal has been received and is being evaluated, said NASA's Jason Crusan, chief technologist for space operations within the Space Operations Mission Directorate at NASA Headquarters in Washington, D.C. If the green light is given, BEAM would be a sub-scale demonstration of the Bigelow Aerospace expandable technology. "In general we're talking about a project that would take about 24 months from go-ahead to the module being on-orbit. It would be pretty fast-paced," Crusan told SPACE.com. To launch BEAM up to the ISS, he said, NASA would use a private rocket company under a Commercial Resupply Services contract. NASA has done evaluations of where BEAM would be robotically berthed on ISS – likely onto one of the station's Node 3 interfaces, Crusan said. New construction is under way at Bigelow Aerospace in North Las Vegas, a building to crank out expandable habitats. First and foremost, use of the private module would be to meet the commercial demonstration needs that Bigelow as a company is looking to address, Crusan said. But at the same time, NASA has a general interest in expandable habitats and "soft-sided" modules, as well as gaining experience on how they perform in orbit. "That performance data would also be valuable to NASA," Crusan added. The base plan is that crew would be going in and out of the module. A secondary benefit of the BEAM demonstration on the ISS is that it provides logistics, stowage and experience in on-orbit operations of a non-rigid aluminum structure, Crusan said. "It's an exciting opportunity for both commercial and NASA to work together."